I got this recipe out of a Taste of Home Quick Cooking magazine the October 2000 issue. I have made this several times and it is always a hit. It is easy and quick to put together. You do have to allow time for freezing. Great summer treat! Cut one ice cream sandwich in half. Place one whole and one half ice cream sandwich along the short side of ungreased 13 x 9 pan. Arrange eight sandwiches in opposite direction in the pan. Spread with half the Cool Whip . Spoon half the fudge topping by teaspoonful's onto the whipped topping. Sprinkle 1/2 the peanuts on the fudge. 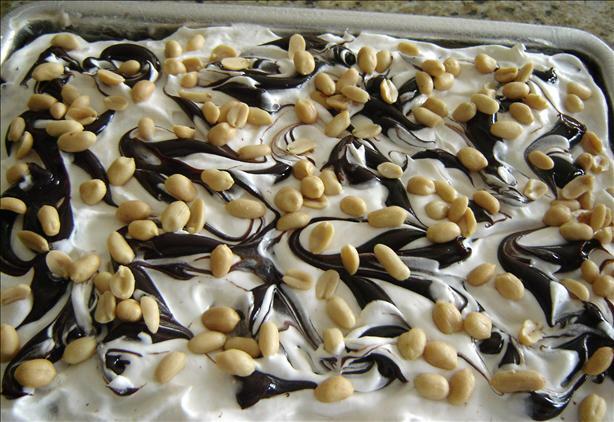 Repeat layers with remaining ice cream sandwiches, cool whip, fudge topping and peanuts.